Firebase Dragon Head: LTTE's ethnic cleansing of the Muslims yet not subsided. LTTE's ethnic cleansing of the Muslims yet not subsided. "TamilEela Viduthali Pulikal strongly believes in Tamil nationalism and we wanted to embrace the Tamils living in North, East, Upcountry and also the Tamil speaking people – Muslims. There is no Tamil nationalism without the participation of the Upcountry Tamils and Muslims who are also Tamil speaking people," emphasized Pillaiyan the special commander of the TMVP led by Colonel Karuna and one of the senior leaders of the outfit. Pilliyan announced that several hundreds of Muslims are already members of the TMVP and they will embrace more Tamil-speaking Muslims to join them and to work together politically and militarily. He explained, "TMVP wanted to embrace the Tamils in the North, East, Upcountry and the Tamil-speaking Muslims. This is what we mean by Tamil Nationalism." He further clarified that it was Prabakaran who was involved in the heinous act of ethnic cleansing by chasing away more than 10,000 Muslims families nearly 90 to 100,000 Muslims from the North on one very fine day. He said, "We live in the midst of the Muslims and they live in our midst and we wanted them to be an integral part of the Tamil nationalism." 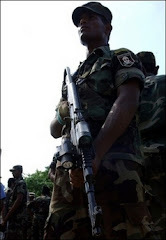 "It is very clear that even after chasing the Muslims out of the Northern Province, who are still languishing in the refugee camps, yet Prabakaran and Anton Balasingham’s revenge against the Muslims have not subsided." "It became clearly evidence that LTTE acts of ethnic cleansing of the Muslims continues, when Balasingham alleged in the last Geneva conference and continues to persists even after the conference, that a Muslim armed group called "Jihad" is in existence in the East. This was a ploy by Balasingham to paint a wrong picture of the peace loving Muslims of the Eastern province." Pilliyan said, "He was trying to play petty politics by demonising the Muslims of the East as terrorists in the eyes of the international community." Pilliyan said "we have seen the Liberian war lord Charles Taylor; the Prabakaran of Liberia arrested and jailed to face charges of anti-human activities in the international court." He added that it want be long for Prabakaran and Anton Balasinghams are arrested and charge sheeted before the international court for acts against humanity."